the special, normal, or proper action of any part or organ. bowel function in the omaha system, the ability of the intestine to digest food and evacuate waste. genitourinary function in the omaha system, the ability of the sexual organs to reproduce and of the kidneys, ureters, bladder, and urethra to produce and excrete urine. neuro-musculo-skeletal function in the omaha system, a client problem in the physiologic domain, defined as the ability of nerves, muscles, and bones to perform or coordinate specific activities. probability density function in statistics, a mathematical function that describes the distribution of measurements for a population. It is a curve that describes the population. 1. The special action or physiologic property of an organ or other part of the body. 2. To perform its special work or office, said of an organ or other part of the body. 3. The general properties of any substance, depending on its chemical character and relation to other substances, according to which it may be grouped (for example, acids, bases, alcohols, esters). 4. A particular reactive grouping in a molecule, for example, a functional group, such as the -OH group of an alcohol. 5. A quality, trait, or fact that is so related to another as to be dependent on and to vary with this other. 6. A mathematic variable or expression. 1. the special, normal, or proper physiologic activity of an organ or part. 2. to perform such activity. 3. in mathematics, a rule that assigns to each member of one set (the domain) a value in another set (the range). 1. The special action or physiological property of an organ or a body part. 2. Something closely related to another thing and dependent on it for its existence, value, or significance, such as growth resulting from nutrition. 1 n, an act, process, or series of processes that serve a purpose. 2 v, to perform an activity or to work properly and normally. Vox populi The activity of a system. See Cognitive function, Core function, Hotel function, Sexual function. 3. The general properties of any substance, depending on its chemical character and relation to other substances, according to which it may be grouped among acids, bases, alcohols, esters, or other groups. 4. A particular reactive grouping in a molecule; e.g., a functional group, such as the -OH group of an alcohol. 1. The particular action of an organ or tissue. 2. Any two variables in which the value of one depends upon the value of the other. contrast sensitivity f . (CSF) The graphical representation of contrast sensitivity for the detection of a sine wave grating from a uniform field as a function of its spatial frequency. It is done by reducing the contrast of a grating until it can no longer be resolved (this point represents the contrast threshold) and repeating the procedure for a number of different spatial frequencies. 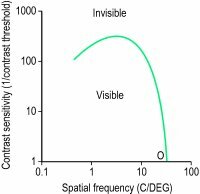 The contrast sensitivity (1/contrast threshold) is plotted against spatial frequency (Fig. F10). The CSF is greatest at a spatial frequency around 3 cycles/degree and the point where the curve intercepts the spatial frequency axis (called the cut-off frequency) represents the standard visual acuity of the subject at 100% contrast. See contrast sensitivity chart; spurious resolution; contrast sensitivity. line-spread f . A mathematical description of the distribution of light across the image of a very thin bright line object. On the retina the image of a thin bright slit spreads over a distance subtending about six minutes of arc at which point the intensity is less than two log units below the maximum. modulation transfer f . (MTF) A relationship between the spatial frequency of an image (e.g. in number of cycles per degree or lines per inch) and the modulation amplitude (i.e. the difference between the luminance at the peaks and troughs of a grating). This gives an indication of the ability of a lens to resolve a grating. The greater the quality of a lens, the higher the spatial frequency at which the modulation amplitude falls to zero. At this point the lens can no longer transfer spatial modulation of intensity from the object to the image and the image appears as a uniform intensity distribution. This technique has been applied to assess the quality of the retinal image by measuring the contrast sensitivity function. 1. Special action or physiologic property of an organ or other body part. 2. General properties of any substance, depending on its chemical character and relation to other substances. serve. Use of the term to express intended purpose may be misleading. n a function that is supplementary or additional to the function for which the part or organ is primarily intended. n the correct action of opposing teeth in the process of mastication; sometimes referred to as normal occlusion. n the simultaneous contact of opposing teeth in a segment or group. n an increase in functional activities of the tooth, which may result in compensatory changes in the attachment apparatus (e.g., a stronger periodontal ligament) with an increase in the number of fibers, a reinforcement of the supporting bone by formation of new bone, and the formation of cemental spikes, which are calcifications of the cemental fibers. Such changes take place so that the increased stress may be withstood without damage. n a diminished, weakened, or less-than-optimal work or action. n the hypofunction of the tooth, which may lead to regressive changes in the attachment apparatus and supporting bone. The severity of lesions varies with the degree of hypofunction. See also atrophy of disuse. n the action of muscle, which is principally contraction. n the degree of activity that stimulates the physical structures but that is so limited as not to irritate those tissues. n the role of the skeleton in relation to the maintenance of body functions. The bony skeleton welds together and protects the softer vital visceral organs, supports and maintains the body form, and accomplishes body movement for locomotion, respiration, manual skills, and the functions associated with mandibular motion. n the function controlled by all the structures of the brain except the outer cortical rim of the cerebrum; most of the nonconscious activities of a sensory and motor nature. 1. the special, normal or proper action of any part or organ. 2. a variable quantity whose value at any time can be determined by the value at that time of some other variable because there is a fixed mathematical relationship between them. The first variable is said to be a function of the second. the basis of all disease; structural abnormalities are important only insofar as they impede normal function. tests which assess the efficiency of functions of the organ, e.g. liver function, renal function tests, glucose tolerance, xylose absorption tests. A. Champaign (as all alcoholic drinks) actually contains a significant amount of calories... :-) No one can function with out eating AT ALL, but they do get more used to eating LESS, and their body adjust itself (i.e. uses the food more efficiently) - it's harmful and may damage them in the short and long term, but it's possible. Q. if a liver has been damaged can it go back to function as normal? A. the liver is an amazing organ. it's cells divide usually once a year but if it needs, it can recover in a miraculously manner. but it depends on how much damage you did. there is a point that it can go no further. but alcoholism cause cirrhosis. this is scar tissue in the liver- that i'm afraid is not reversible. and most of it's side effects are not too. Q. Last year my doctor diagnosed that my kidney was not functioning well. Can anyone help me? I’m 50 year old male. Last year my doctor diagnosed that my kidney was not functioning well. I intake western medicine for past one year, but I’m not satisfied with that. I like to move to some other treatment. Can anyone help me? A. Hello Jude, I understand your problem and I do have a similar issue. Initially I was trying with the western meds and it did not give me the desired results. I have skipped them now and have been taking Chinese herbal medicine and trust me I feel much better. Consult a TCM doctor before taking any supplements to improve your kidneys. I wish you to get well soon!! !